Singapore's e-government model is considered to be among the best in the world. Over the past decade, the Singapore government has constantly developed and re-invented its online presence. International comparisons have consistently rated Singapore as one of the most advanced e-government nations. However, despite significant progress towards full e-government maturity, some issues of full public participation remain. It is these issues that this chapter discusses. In particular, it considers the ways in which a digital divide within the Singapore model has emerged, despite specific policies to address such a problem. The Singapore e-Government Masterplan 2011-2015 (or eGov2015) ushers in a new era, where the Government aims to shift from a “Government-to-You” approach to a “Government-with-You” approach in the delivery of government e-services. The goal is to facilitate more co-creation and interaction between the Government, the people and the private sector to bring about greater value creation for Singapore and our people. Increasing the participation of local citizens in the daily life of governing has been an enduring though not always an intended aspect of what is called the ICT revolution. Where once politics at all levels was about merely electing officials and leaving it to them to do what is best for the country, state or region, the contemporary political landscape in many countries is now a two-way street whereby communication and consultation between the electorate and the officials they elect is an ongoing process. As such E-Government has become a major concern for many nations around the world over the last two decades or so, with the ability to use Information and communication technology (ICTs) considered by many policy makers as part of ‘the indispensable grammar of modern life’ and a fundamental aspect of citizenship in the ever expanding information society (Wills 1999, 10). 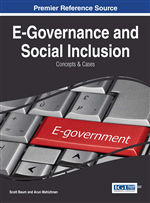 While many models have been developed (Coursey and Norris 2008) the most common type of E-government model focuses on providing easy access to citizen centered services and generating efficiencies in government administration. However, it is widely acknowledged that a mature and robust E-government is not simply related to the technologizing of government business. Rather ‘it is about governments ‘moving stepwise toward the adoption of more sophisticated e-government offerings, moving from information to transactions to integration and ultimately to transformation (Coursey and Norris 2008, 532). Moreover, as noted by advocates of E-government, developing a successful E-government sector is associated with a range of beneficial outcomes including the potential to foster strong and robust political debate, enhanced civil society and strengthened relations between citizens and those who govern (Martin and Byrne 2003). In adopting an E-Government philosophy or framework, governments proclaim an intention to be inclusive and equitable in providing e-services to its public. However, as with many social and economic policies and processes, outcomes may be far from equitable. Within discussions around policy and ICTs the emergence of digital exclusion alongside broader discussions about social exclusion and inclusion entered the political discourse during the 1990s (Selwyn 2002) with debates around the ‘information haves’ and ‘information have-nots’ (Wresch 1996), ‘information and communication poverty’ (Belnaves et al. 1991) and the ‘digital divide’ (Jurich 2000, Parker 2000).